That little can of mandarin oranges in your cupboard is good for more than just a salad! I've muddled a few in this orange and grapefruit cocktail and used them as the garnish as well. 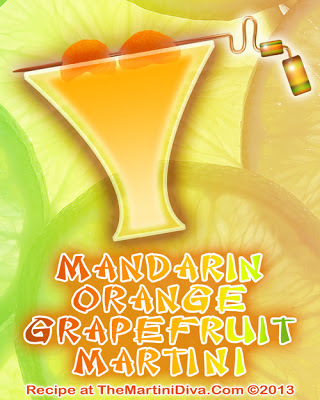 In a pinch they'll substitute for oranges and orange juice in other cocktails! Chill your martini glass in the freezer. Pour the grapefruit vodka, 3 or 4 slices of the Mandarin oranges, the Mandarin orange juice, Triple Sec and Orange Juice into a blender and pulse blend until smooth. 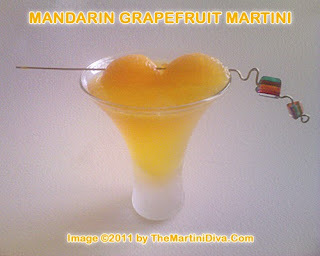 Pour this into your chilled glass, skewer a few of the remaining Mandarin Orange slices onto a cocktail pick, place this on the rim and enjoy! Purchase it on Customizable Greeting Cards or Postcards Here.